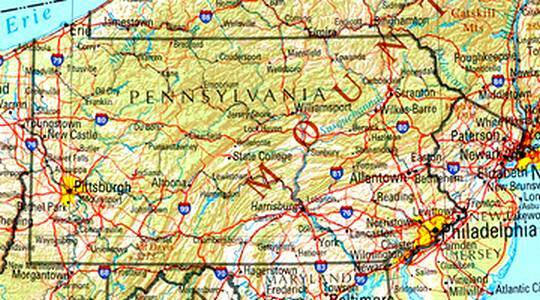 Take your time and study the Pennsylvania Map before visiting the Pennsylvania Mountains and it's many Historic Family Attractions. Feel free to print out the Pennsylvania State Map and take it along while exploring the many nooks and crannies through the Pennsylvania Mountains. There are many Pennsylvania Attractions hidden in places you'd never expect. As you can see the map shows many small cities, villages, and communities located between the larger more popular cities. Don't let their size or location fool you. Take the scenic routes and enjoy sites and family attractions that will charm you with history, entertainment, and amazement.